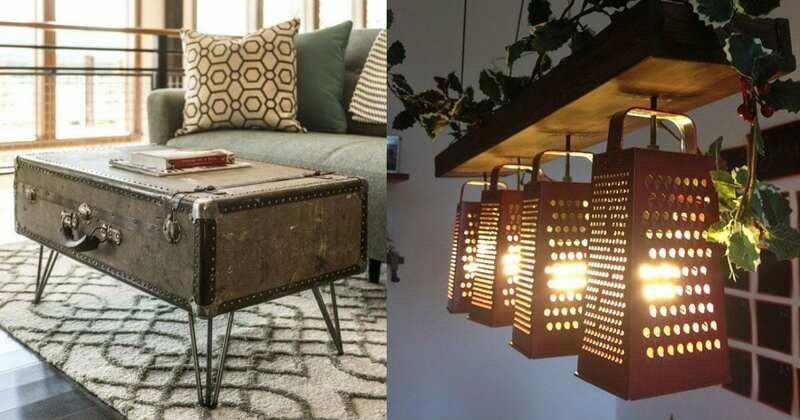 These days, the internet is all about upcycling: reusing old trash in new and creative ways. But it takes some thought to upcycle to create things that not only look nice (after all, you don’t want it looking like trash!) but also useful. That means it takes a bit more than just reusing your old plastic bottles. But if you spend any time looking around the internet, you’ll find that people get seriously creative with this stuff. They use trash in ways that most of us would never even think of. And that’s the best thing about the internet — we can all share ideas from people around the world! Next time you think you have a pile of junk that needs to be hauled to the recycling plant, junkyard, or your nearest Goodwill, think about the ways you could reuse it. Then take a tip from these awesome people who knew how to turn their useless junk into useful items. You might think a few of them are pretty silly, but hey, if they work, don’t laugh! You may find yourself in need of a bicycle with shoes one day. Okay, probably not that. 1. There’s no need for a second seat when you have a plastic bottle. The owner of this bike apparently has a passenger coming along for the ride. But with nowhere to sit, they were looking at an uncomfortable and possibly slightly dangerous trip. Thankfully, they had the ingenious idea of attaching a plastic bottle to the back. Now there’s room for two! 2. This takes some talent and a love of hookah. This one probably is a little trickier, and unless you really love smoking hookah, you probably won’t attempt it! 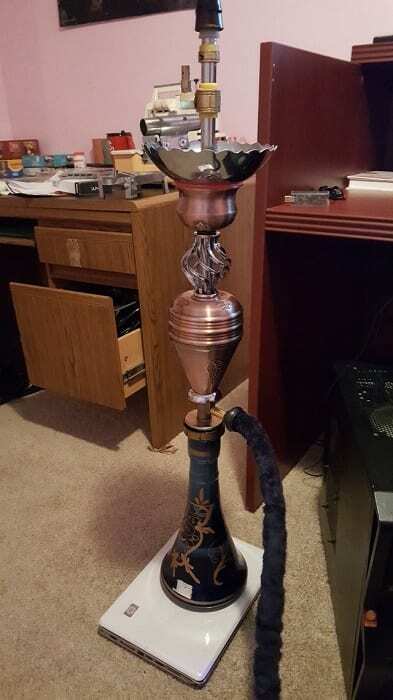 This person made their own hookah out of a bunch of old parts. They needed a stand for the bottom, so of course, they used an old computer. What else are you supposed to do with it? 3. Jack Daniels would be so proud. 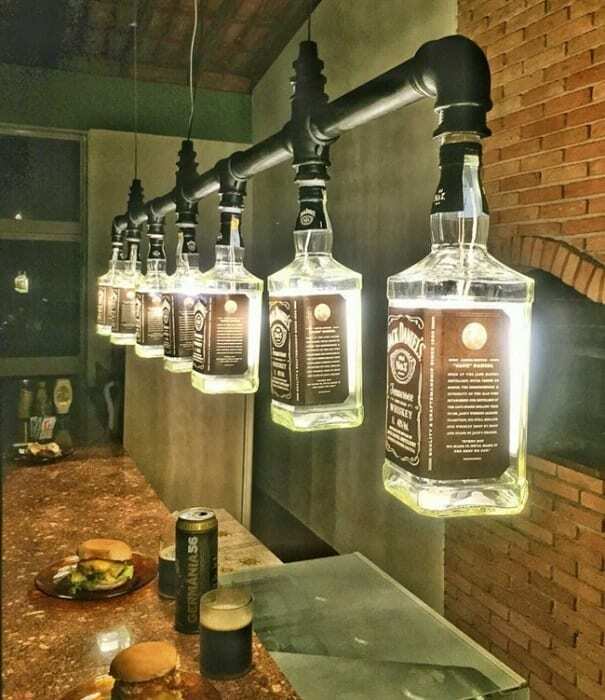 This bar had the ingenious idea to use a bunch of old Jack Daniels bottles as covers for their lights. Well, it’s the perfect place for an alcohol-based lighting theme. Now, how many bar patrons did it take to empty all those whiskey bottles? We count seven hanging above the bar. 4. We think these lights are just “grate”! Here’s another time someone made some setting-appropriate lights! 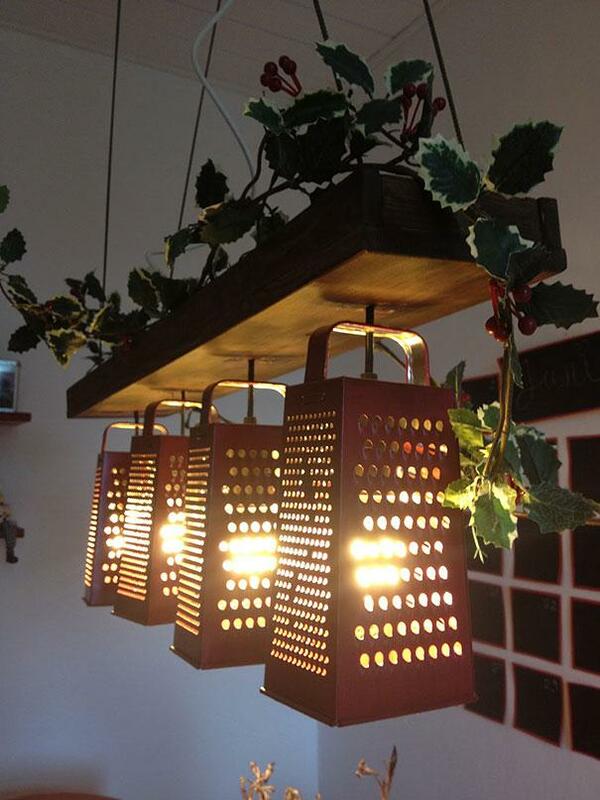 These stylish kitchen lamps are covered by a cheese grater. They make quite the conversation piece. And if you need some shredded cheese in a hurry, simply reach above your head. Just be careful about touching them — you don’t want to lose any skin. 5. These tennis rackets make for super cute mirrors. Need to check your hair while you’re heading out the door? Have a couple of old tennis rackets gathering dust in your garage? The solution is obvious! 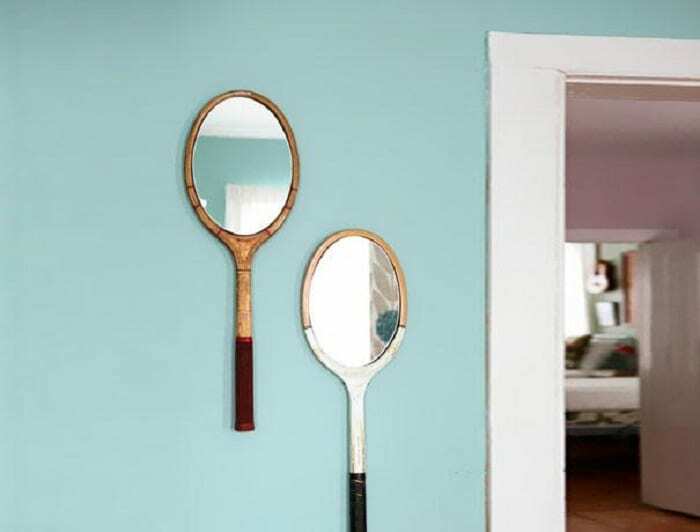 Just kidding, it’s actually super creative, and it’s a very cute way to repurpose old sports equipment into adorable home decor. 6. These DIY lamps have their own special shine. 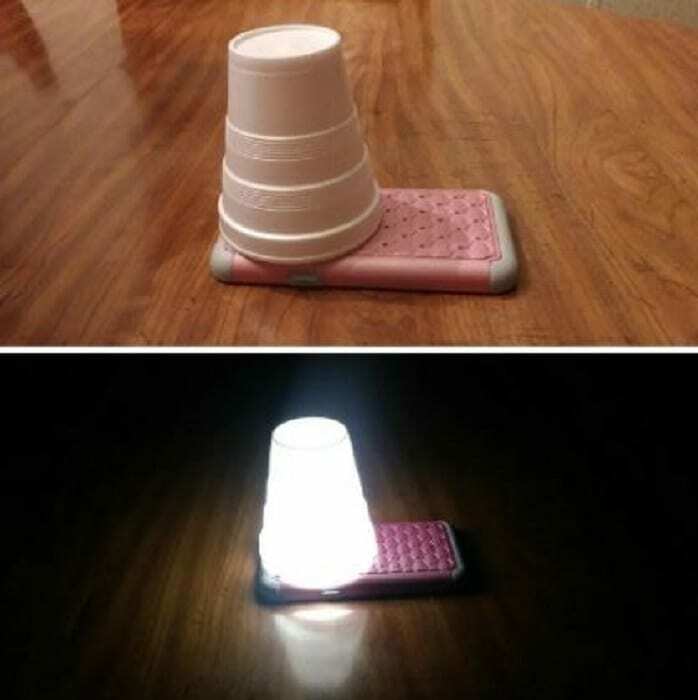 People clearly have all sorts of amazing ideas when it comes to making their own lamps and light covers. 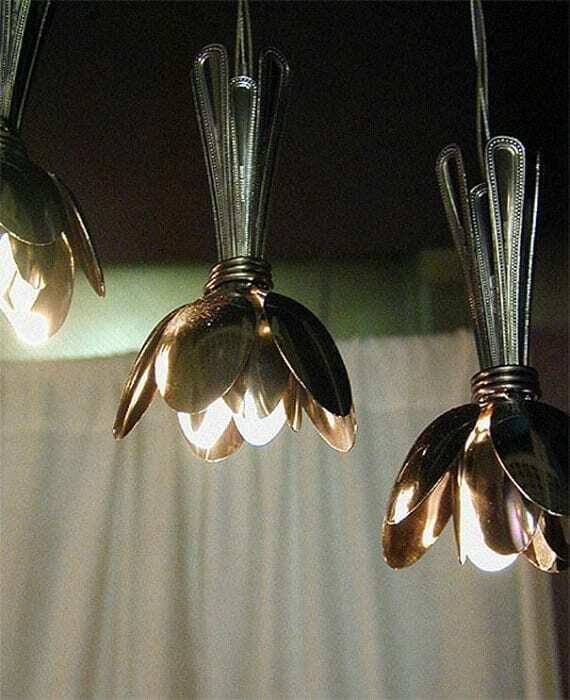 Just look at this creative spoon arrangement covering the kitchen lights. The only thing to be careful of is the type of light bulb you use — depending on your choice, that metal could get super-hot! 7. This is a handy-dandy tip for the next power outage. You’re sitting there, enjoying a Netflix show when suddenly, you hear a clap of thunder and the power fizzles out. You can use your cell phone flashlight … if you want to have a beam of light directly in your eyes. Instead, try breaking up that glare with a Styrofoam cup. It will also give off more light. 8. This is less of an upcycling trick, more of a life hack. 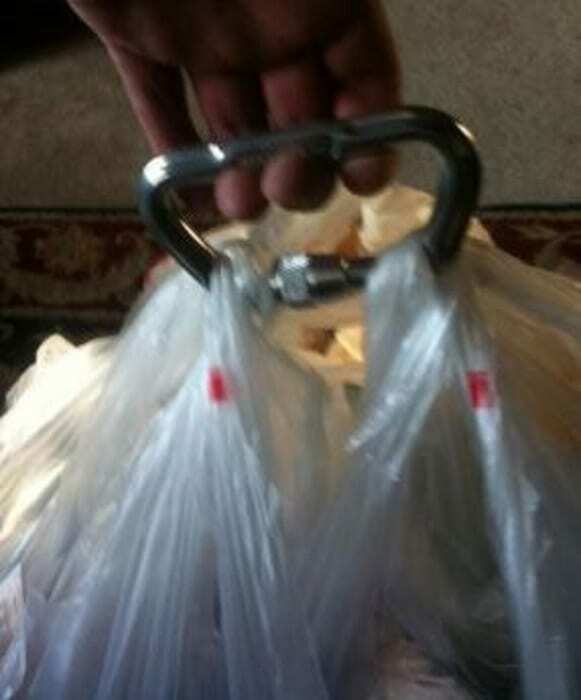 We all have the weird need to get those grocery bags in one trick. Why? No one can really say. This is a great way to make it way easier by distributing the weight and taking it off your wrists and hands. Plus, you’ll look like you have superhuman strength carrying 50 pounds of groceries. 9. Who need candleholders when you have old funnels? There comes a time when every piece of kitchenware loses its usefulness, but that doesn’t mean it has to go into the trash can! 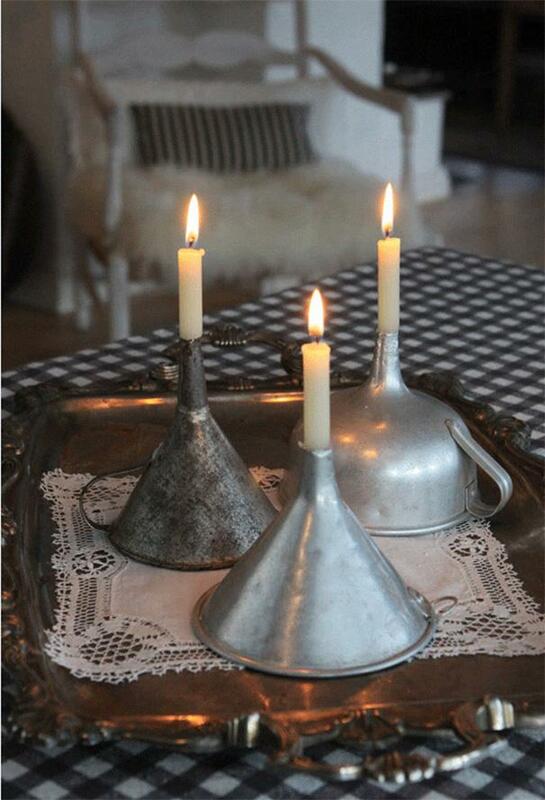 This person has repurposed some old funnels into cool-looking candle holders. It actually looks like a perfect design. They have handles and a wide base, looking as though they were made for this purpose. 10. Laugh all you want, but he’s going places. This might look absolutely ridiculous but the important thing is it actually works! 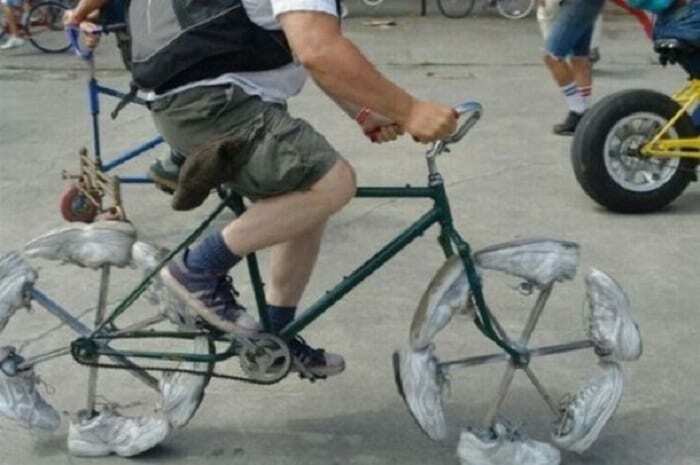 This guy had a brilliant idea for what to do when he needed a couple of bike tires. It’s got a double use, actually: it’s also a great way to strike up a conversation with someone. 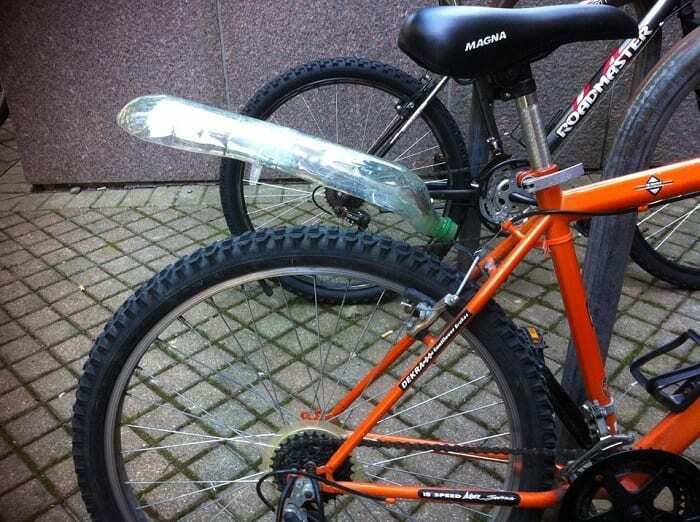 I noticed you were staring at my bike there…. People are definitely attached to their old game consoles, especially things like this retro Nintendo system. There are so many fond memories attached to them of playing video games with your friends back in the day. 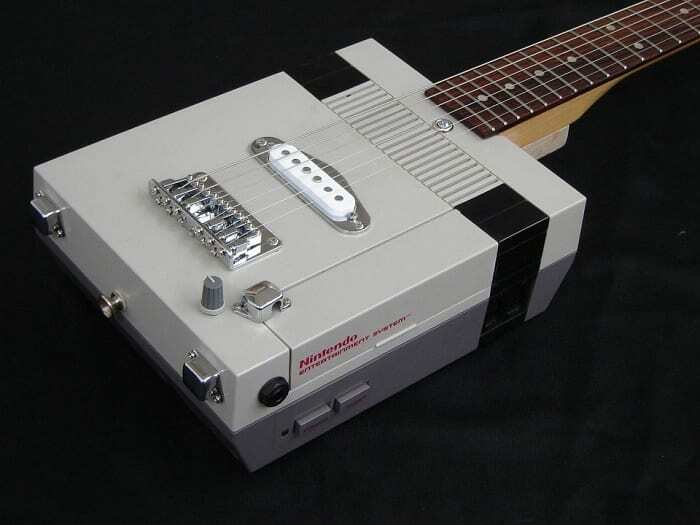 Now, this person is using their old game console to make new memories by turning it into a guitar! 12. This was clearly thought up by a parent. Plenty of kids go through a phase where they’re absolutely obsessed with dinosaurs. Parents get used to not being able to walk through the house without tripping over plastic stegosauruses and velociraptors. 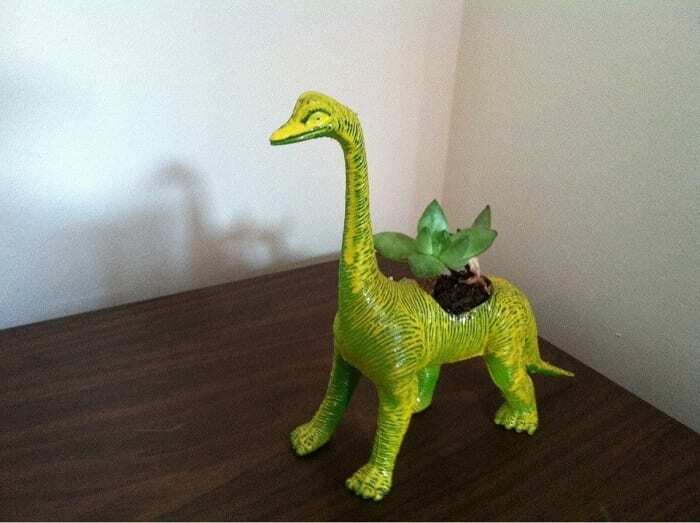 Apparently, when your son or daughter is all grown up, those beloved old dinosaurs can be reused as planters. 13. Call it crazy, but it makes a place to sit! 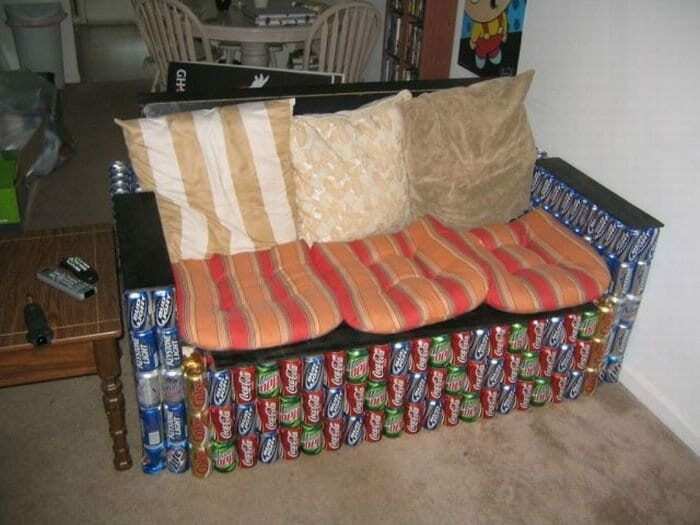 Well, this person needed a couch, but they also drank a lot of soda and beer. No, make that a LOT OF SODA AND BEER. But it’s a good thing they did because it gave them the opportunity to make this awesome sofa. Now that they’ve done that, they should probably cut back on the drinking for their sake. 14. 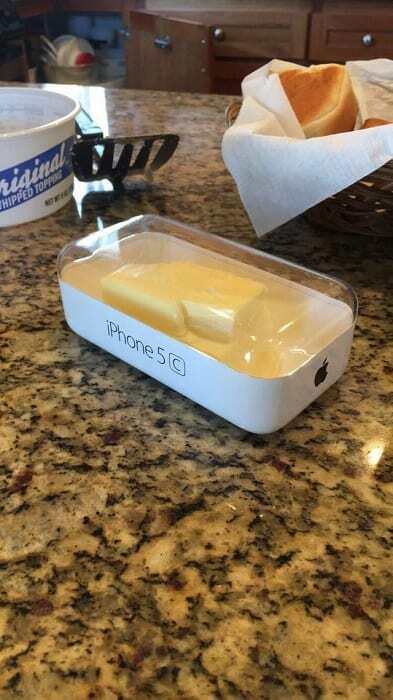 It may say Apple, but it’s full of butter. This is actually a great idea on Grandma’s part. Older people usually aren’t best friends with technology, but this lady found a way to connect with her new tech … or at least the case. Now she has an innovative way to keep her butter ready for use. It’s how we do it in the 21st century! 15. This is how to turn trash into something beautiful. 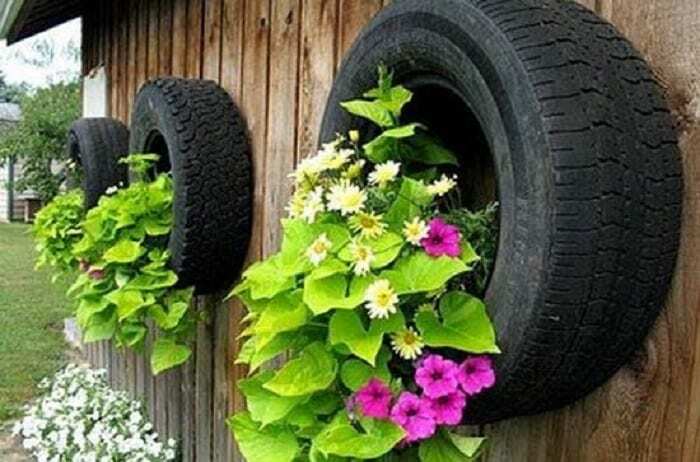 This person had the genius idea of reusing old tires and turning them into garden planters. They’ll be super durable and resistant to bad weather, plus they’ll retain some heat for the plants to thrive. And of course, there’s the added bonus of putting old junk to new use. 16. This looks it’s straight out of a steampunk novel. 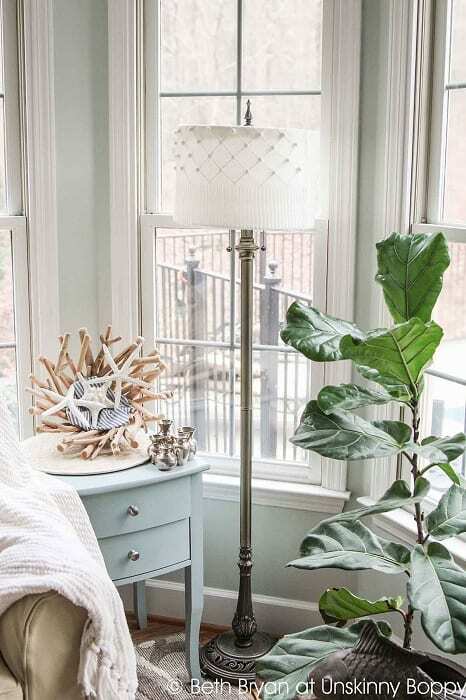 Some upcycling gives people a chance to showcase all their skills — like the ability to turn a bunch of old clocks into an amazing lamp. 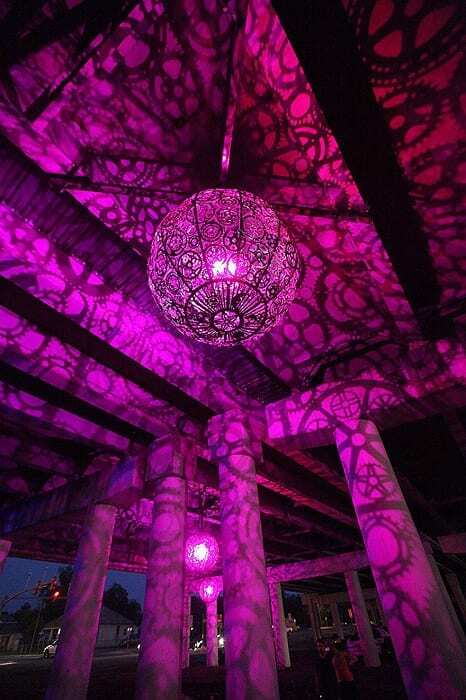 The different cogs and gears make an awesome pattern that throws light over the walls in a really unique way. 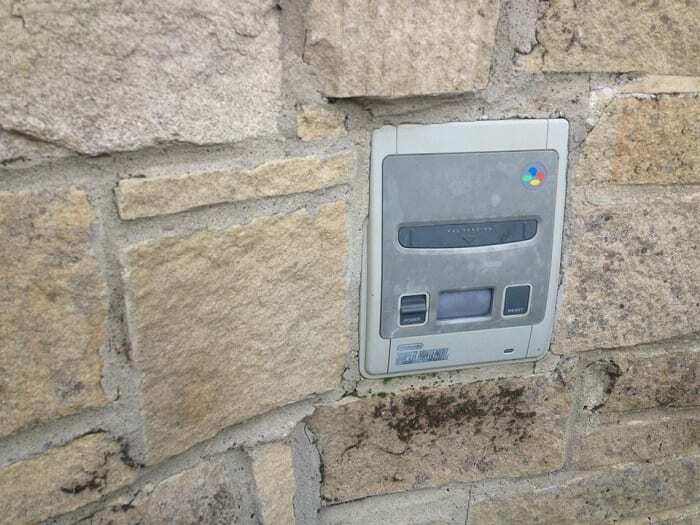 This is such a cool idea for something that didn’t have a lot of use anymore. 17. By now, this one is a classic. Everyone these days has a ton of wires and cords around their house. When you’re not using them, they’re difficult to store and tend to get tangled up, making them more annoying than useful. 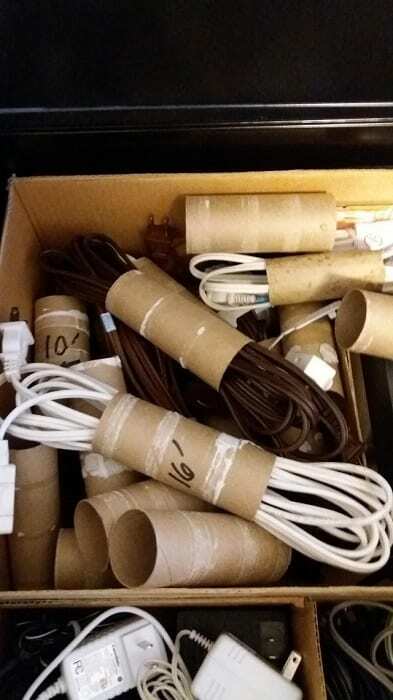 This person found a smart way to keep cords organized and easy to find while also reusing old toilet paper rolls. It’s simple but brilliant. 18. Well, this is thinking outside the box. People say that technology used to be more durable. Back in 2003, if you dropped a cell phone from a second-floor balcony, it wouldn’t have a scratch on it. Nowadays, if it falls off your bed, say hello to your new screen design. The same goes for gaming components, they were a lot sturdier in the past. If you need a replacement brick, pull out your old Nintendo controller. 19. This is a very important question. The next time you ask yourself, “What should I do with this old drum kit?” look no further for your answer. Okay, most people probably don’t have this problem, but that just means this person’s solution was all the more creative. They made it into a super cool chandelier that is sure to be a conversation piece. 20. Don’t haul that washing machine off to the dump just yet. When some things break down, they become really frustrating to get rid of. These are usually large or unusual items — things you don’t necessarily throw away every day. It’s not like you can find a trash can on the street labeled “old washing machines”! 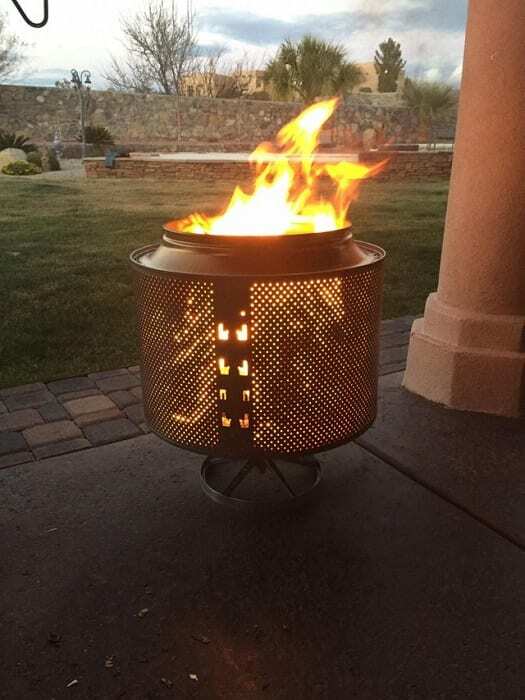 This clever person sidestepped the whole issue and got themselves a new fire pit in return. 21. The same goes for any clunky old computers. We rely on computers in this day and age, but once they’re outdated, they’re really outdated. There’s basically no use for a computer from 20 or even 10 years ago. But that doesn’t mean they can’t be reused in fun or creative ways. This person was able to rig up a mini fridge out of an old computer unit. 22. For the next time that your armor is in the wash.
You may be asking yourself, “Do I really need something like this?” and the answer is yes, absolutely. 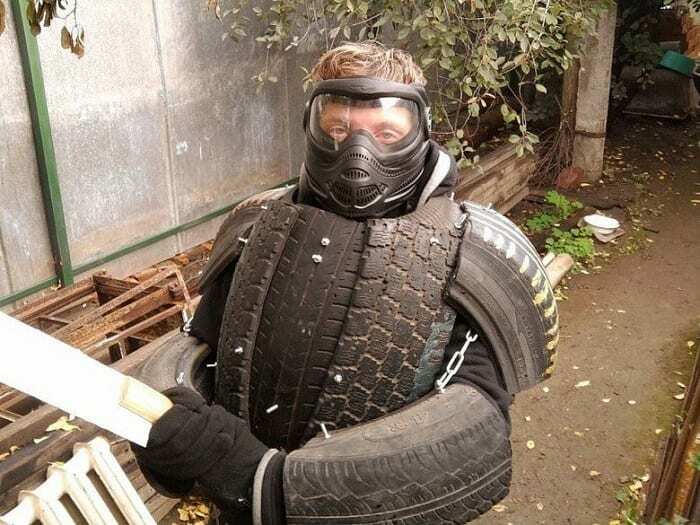 Everyone needs a suit of homemade armor made completely out of old tires. All the modern knights are into it for its flexibility, protection, and total body comfort. Just ask anyone at the Round Table to tell you about it. 23. It’s a crocodile, it’s a mouse, it’s crockamouse! This one looks like it needs a tutorial. If you happen to have a bunch of old computer mice lying around, maybe you’ll be interested in learning how to make statues out of them. One thing is certain — it took an interesting person to come up with an idea like this! 24. An economical way to get a hamburger. This upcycling hack is a brilliant way to reuse old metal cans and get something very useful out of the bargain. 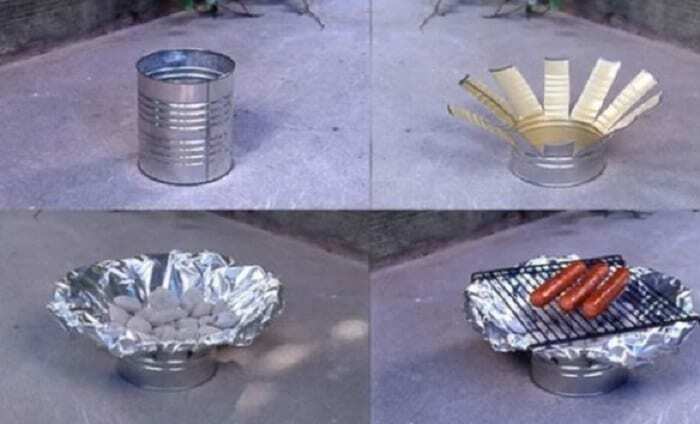 Store bought grills are a couple hundred dollars at a minimum, so this is a clever way to prepare for your next outdoor get-together without spending much money. After all, the hot dogs will taste just as good! 25. But where did you get the shopping cart? This is a pretty clever way to make a comfortable and portable lawn chair with just a little bit of crafting. But the real question is, where did this person get the shopping cart in the first place? 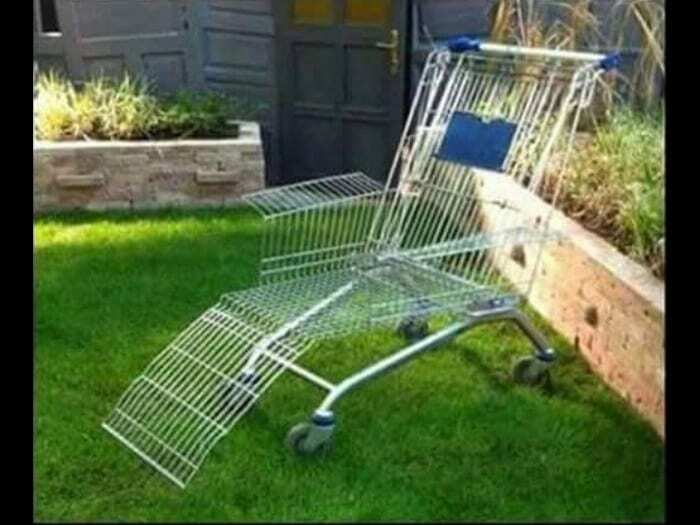 Let this serve as a public service announcement: shopping cart lawn chairs are cool, but you still shouldn’t steal shopping carts! 26. This is the perfect solution for book hoarders everywhere. If you have a lot of books, you know exactly how much room bookshelves can take up. 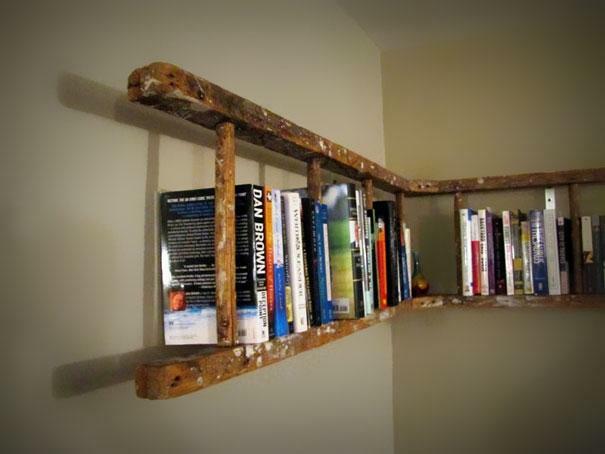 This person had the idea to use some old ladders as a way to make a thrifty bookshelf with plenty of space. If you stack those shelves high enough, you might need … well, a ladder to reach the books at the top! 27. Take that, fancy IKEA glass racks. You could run to a store and buy an expensive glass rack for all your wine glasses. Or you could rustle up this simple, rustic DIY one out of an old rake. 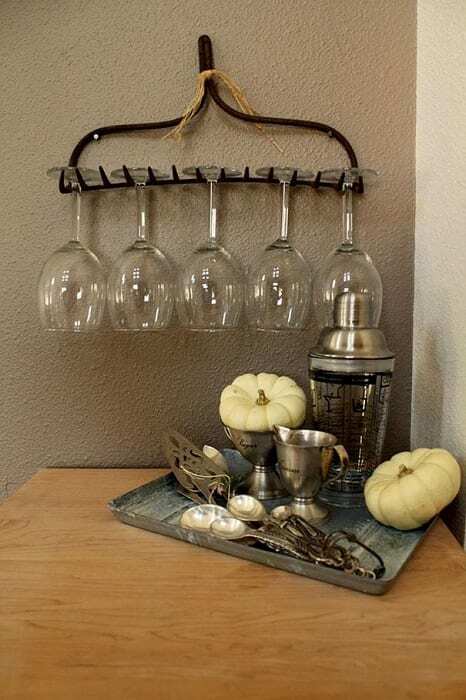 It looks so cute, and it’s a perfect way to store wine glasses. Just make sure to pop the handle off first — maybe you can find a way to reuse that, too. 28. This suitcase isn’t going anywhere these days. There are tons of ideas online for DIY furniture, and for good reason – buying new pieces gets expensive fast! 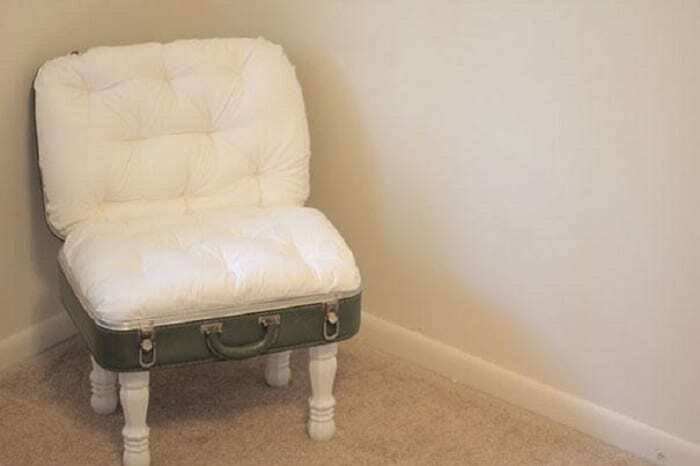 This is an awesome way to repurpose an old suitcase. Just secure a pillow inside and add some legs. Of course, this means there are tons of ways to do that to come up with something super unique. 29. Turn an old wine bottle into a trendy colored light. 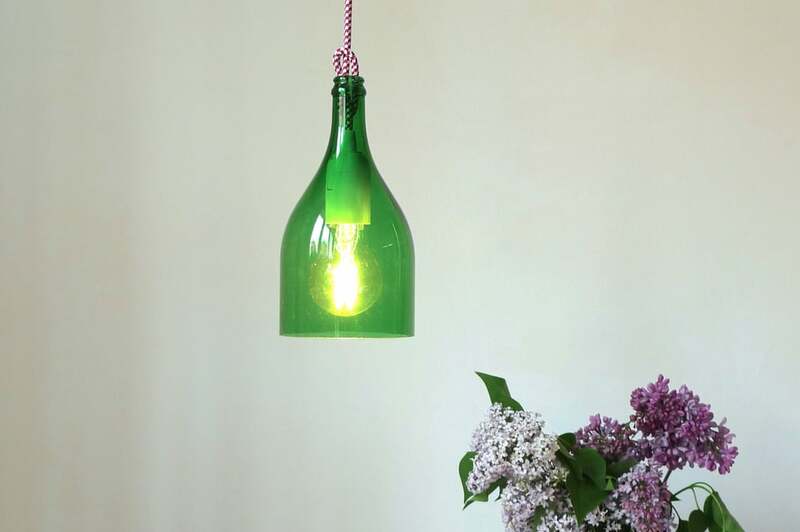 There are tons of ways to make eye-catching lamps and shades out of old bottles. This person used half of an old wine bottle to make an easy hanging light. It’s fairly simple to cut a wine bottle in half — some tutorials will show you how to do it with just a couple of standard household items. 30. Tires can also make for colorful, comfy chairs. Tires are objects that once worn out, aren’t good for their original use any longer. But they’re still made of super solid, durable material that has tons of other uses. 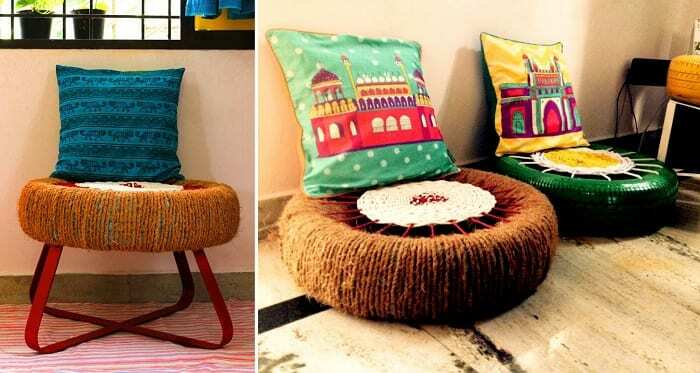 This person turned them into comfortable, unique chairs with just a little bit of craftiness and time. 31. There’s more than one use for an outdated suitcase. Once upon a time, suitcases were made of super hard, durable material. 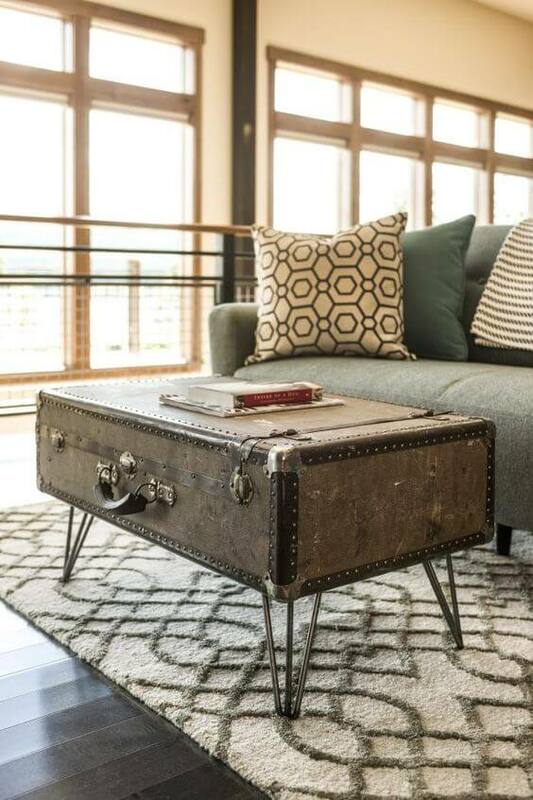 If you have a vintage suitcase, there are a lot of ways to put it to use that are actually pretty striking. Here, an old suitcase is being used as a coffee table. They’ve attached some legs and that’s it! 32. 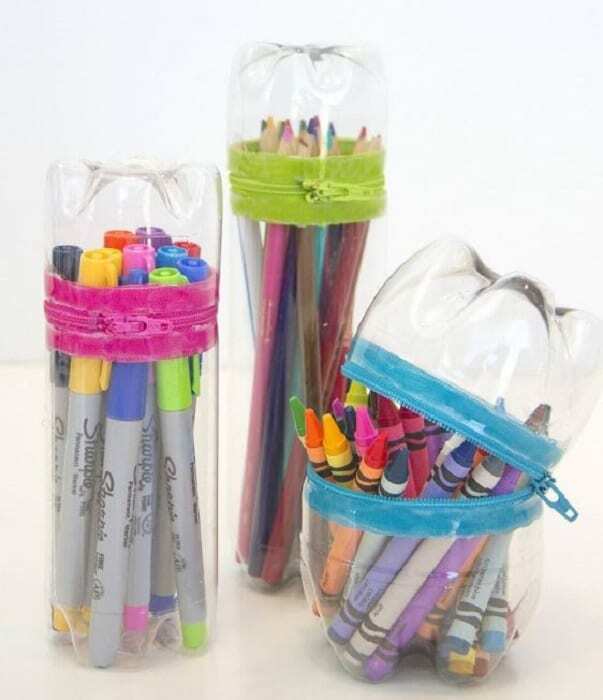 Upcycling plastic bottles into pencil cases is amazing. There’s no doubt about it, plastic waste is a huge problem, with tons upon tons clogging the oceans. At home, pencils and crayons clutter things up too, especially with kids around. 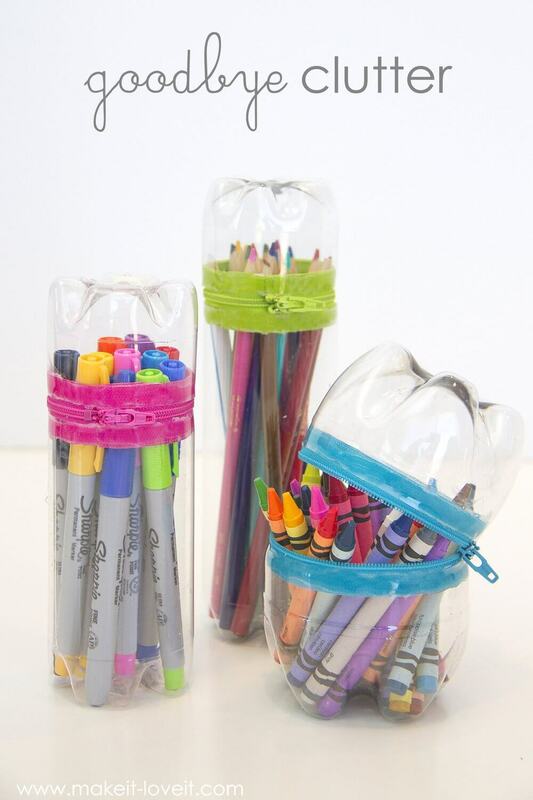 This person found a clever way to make DIY pencil cases out of two-liter soda bottles. 33. Using old fabrics is just as great. Most people don’t know it, but fabric waste is also a big issue. Americans throw out millions of pounds of textiles every year, most of them ending up in landfills. Here’s a great way to reuse an old sweater with intricate decoration. 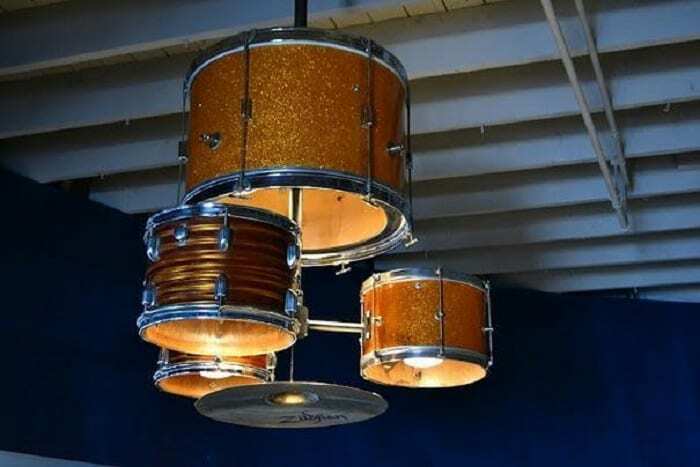 Remake it into a unique lampshade! 34. Put a new kind of bean in old coffee cans. We all love a good cup of coffee but there’s no need to throw away all your old metal coffee cans. 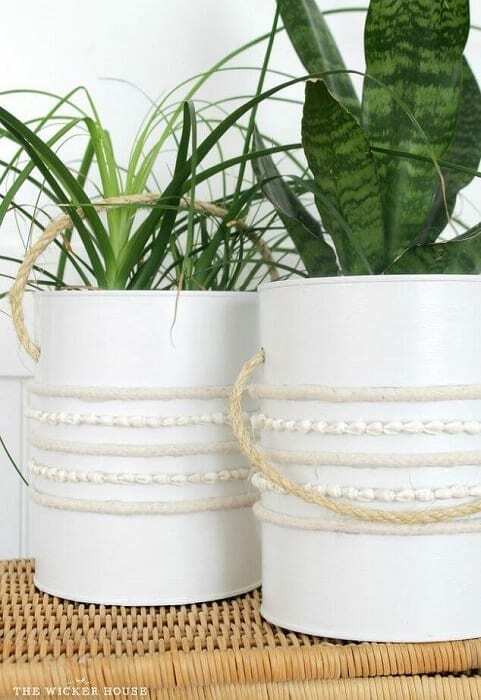 You can reuse them as planters inside or outside the house. If you like, you can repaint them to make them more decorative or just leave them as is: soil, water, and sunlight are all they need. 35. 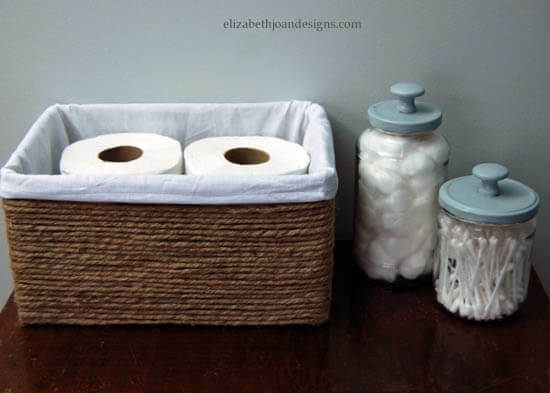 Use regular boxes for stylish storage. You can spend a lot of money on storage containers or you can use what everyone has around the house: cardboard boxes. All they need is a simple makeover with some crafting items and you can turn them into adorable decorative items that are also super useful. Case in point? 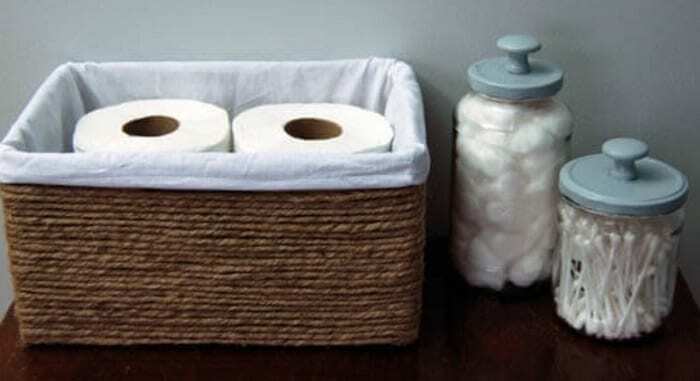 A little rope turned this box into what looks like an expensive wicker basket.